Enhance your health and endurance potential by helping clean out your body toxins while promoting improvement in your cardiovascular system! 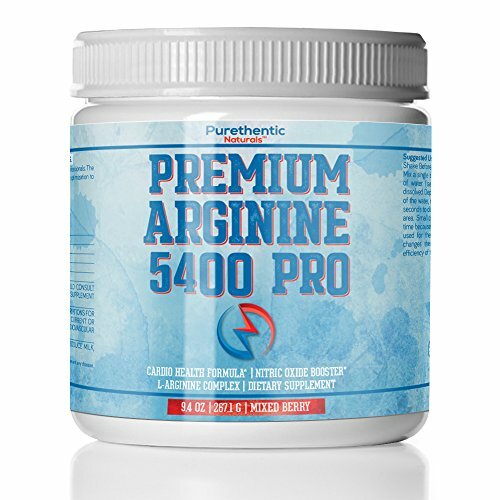 When you need to reach your maximum L-arginine levels, look no further than Purethentic Naturals Arginine 5400 Pro. Our advanced formula is designed to promote healthy blood pressure and cholesterol levels, both of which can help create a healthier cardiovascular system. Not only that, but L-arginine can help remove toxins, waste and excess nitrogen from your body to promote more balanced hormone levels; all major factors, especially for active adults looking to balance health, boost muscle mass and help synthesize proteins. When you need an arginine formula that absorbs faster and helps maximize your health benefits, choose Purethentic Naturals Premium Arginine 5400 Pro. Click "Add to Cart" now and take us up on our PURETHENTIC NATURALS, NO RISK, 60 DAY MONEY BACK PROMISE and begin assisting your health immediately. POWERFUL FORMULA: This 1 Month Supply of Premium Arginine 5400 Pro contains a power blend of 5400mg of L Arginine and 1000mg of L Citrulline. Including: essential amino acids, calcium, and an L-Arginine powder / Citrulline powder combination that is based on Nobel Prize Winning research. MAINTAIN A HEALTHY HEART: Our premium citrulline arginine combination is designed to help lower your cholesterol, promote an increase in your circulation and help regulate healthy blood pressure levels, all so you can maintain a healthier cardiovascular system. IMMUNE SYSTEM BOOSTER: When you want to help boost your immune system, choose a arginine formula that's stronger than l-arginine 1000mg capsules or l-arginine powder 5000mg and go with our 5400mg per serving formula! PROMOTE BODY DETOX: 5400 Pro l-arginine contains essential amino acids that can help remove toxins from your body so your system can be healthier, cleaner and help run more efficiently. If you have any questions about this product by Purethentic Naturals, contact us by completing and submitting the form below. If you are looking for a specif part number, please include it with your message.